Sudan is host to the biggest number of IDPs in the world today and is mostly due to armed conflict and tribal wars which have been fought for over three or four decades. This paper explores the impact of displacement herein associated to armed conflict to the physical health of displaced children in IDP camps in southern Sudan. The paper argues that, children have both in a short and long-run suffered in this war and yet they remained invisible in the statistics, in interventions and their experience with their parents in displaced persons camps seems to count less. This paper raises and as well tries to answer questions regarding pertinent issues fundamental to displaced children in IDP camps. 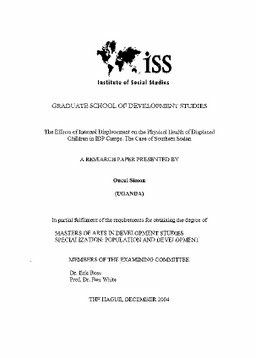 This study utilised data from various studies and surveys, reports on interventions in different parts of southern Su<;ian to justifY and build an argument that displacement and subsequent life affect physical health of children. This study was conceived on the idea that displaced children undergo physical health problems in the course of their lives as displacement destroys the livelihoods of families which admittedly affects the capacities of parents to provide for the children's needs. Detailed examination of water and sanitation, hygiene and health conditions in camps, food problems, issues like health rights abuses and camps protection, security and insecurity problems are discussed in the study. Based on the findings, this study draws some conclusions that can help in reshaping interventions to strategically focus on not just immediate needs but long-term development issues. More important the study also emphasises the need for quality information collection which covers all IDPs and coordination of all humanitarian efforts.